The lead researcher of this Roman study appears to be a PhD student of anthropology. Perhaps we will get a supplement regarding the phenotypical information of the Romans, but based on the clustering of these samples I would strongly expect to see a population comprised of mainly brown hair and eyes with perhaps a minority of blonde hair and blue eyes amongst the "North Italians" of the Republic (all being well within the European skin spectrum, of course). 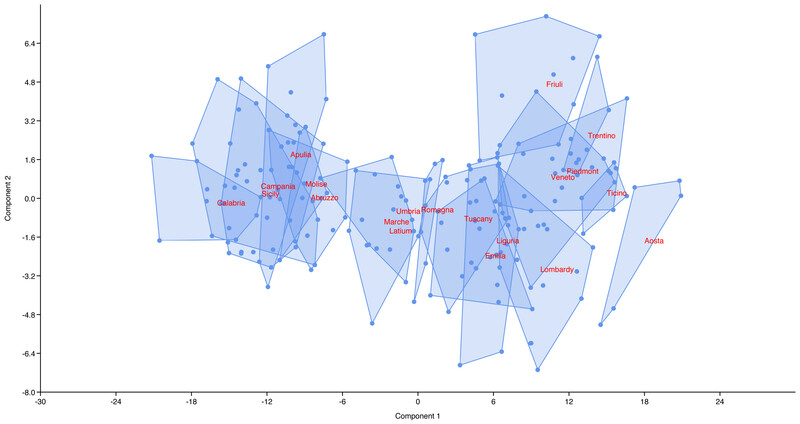 Remember that although the centroid of clustering for the Iron Age Romans of Latium was like that of a Tuscan, not a single one of those samples genuinely clustered like a Tuscan (and by extension, your Coriscan friend). I have to agree with Erik here. The Latial Culture which spanned from 1000-580 BC had strong roots in the Proto-Villanovan Culture, which was an Urnfield Culture (not to be confused with the Villanovan Culture). The Proto-Villanovan Culture reached all the way to N.E. Sicily where the Siculi spoke a language that was probably Latin-like. Being that modern N.Italians and S.Italians are relatively distant populations from one another, I think it is more likely that the N.Italian like 60% represent the "native" Italics and the 40% represent a mix of previously N.Italian like locals mixed with populations coming from the East as early as the Orientalizing Period. Venice formed from veneti from Treviso and Padua and everyone in between these cities and the lagoon. Thanks for your first hand summary of the Moots presentation. When you talk about north Italy, central Italy and south Italy what exactly are we talking about? Do you know which samples we are talking about? Because north Italians are quite varied and the centroid of central Italians is more southern than the Tuscans, as well highlighted by the study of Raveane et al. Last edited by Taurus; 02-10-2019 at 08:35 PM. Strange that Umbria and Romagna are more South than Tuscany. Specially when you think of the fact that Tuscany was populated by the Etruscan's who are said to be from Anatolia in first place( They do resemble ancestors of Villanova culture in culture tho'). Specially when you think of the fact that Tuscany was populated by the Etruscan's who are said to be from Anatolia in first place( They do resemble ancestors of Villanova culture in culture tho'). Seven Etruscan skulls were found in Corneto Tarquinia in the years 1881 and 1882 and were given as present to Rostock's anatomical collection in 1882. The origin of the Etruscans who were contemporary with the Celts is not yet clear; according to Herodotus they had emigrated from Lydia in Asia Minor to Italy. To fit the Etruscan skulls into an ethnological grid they were compared with skeletal remains of the first thousand years B.C. E. All skulls were found to be male; their age ranged from 20 to 60 years, with an average age of about thirty. A comparison of the median sagittal outlines of the Etruscan skulls and the contemporary Hallstatt-Celtic skulls from North Bavaria showed that the former were shorter and lower. Maximum skull length, minimum frontal breadth, ear bregma height, bizygomatical breadth and orbital breadth of the Etruscan skulls were statistically significantly less developed compared to Hallstatt-Celtics from North Bavaria. In comparison to other contemporary skeletal remains the Etruscan skulls had no similarities in common with Hallstatt-Celtic skulls from North Bavaria and Baden-Württemberg but rather with Hallstatt-Celtic skulls from Hallstatt in Austria. Compared to chronologically adjacent skeletal remains the Etruscan skulls did not show similarities with Early Bronze Age skulls from Moravia but with Latène-Celtic skulls from Manching in South Bavaria. Due to the similarities of the Etruscan skulls with some Celtic skulls from South Bavaria and Austria, it seems more likely that the Etruscans were original inhabitants of Etruria than immigrants. Thank you for posting! Like I said - Just looking at Villonova culture and Etruscan + Celtic you see similarities. The R1b-U152 Y-dna branch is said to be a Italo-celtic branch who is common in North Italy and Tuscany. Could be from both Celtic invaders + Early Italics(Villonova) and maybe also Etruscans.